Paul Draper was yet another target of McCarthy-era attacks who found a brief refuge in Ridgefield. An international dancing star who was called “the aristocrat of tap,” Draper danced on the major stages of Europe and the United States with top stars of the 1930s and 40s. He wound up in exile in Europe but unlike his close friend, harmonica virtuoso and fellow Ridgefielder and McCarthy victim, Larry Adler, Draper returned to the United States to teach, dance and choreograph new works. Paul Draper was born in 1909 in Florence, Italy, into an artistic, socially prominent New York City family. His mother Muriel Draper was a writer and lecturer whose later home in London hosted such guests as Pablo Picasso, Henry James and Arthur Rubinstein. Novelist Norman Douglas promised a young Paul a penny every time he was naughty. From a young age he loved to dance and mostly self-taught himself tap — he reportedly took only six lessons in his life. After teaching briefly at an Arthur Murray studio in Manhattan as a teenager, Draper moved to London, hoping to find work in tap dancing. “He scraped together a living performing flashy routines in Europe and the United States, then enrolled in the School of American Ballet and realized the possibilities of combining tap and classical ballet,” said entertainment historian David Lobosco. Draper got into the school with the help of his mother’s friend, George Balanchine. He made his solo debut in London in 1932, introducing his new “ballet-tap” technique. 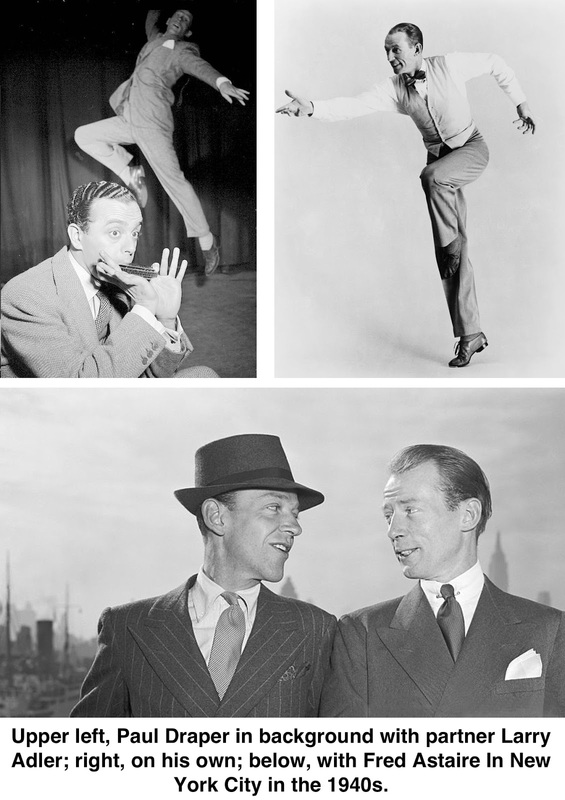 His career blossomed in the 1930s as he performed in Europe and the U.S. with his combination of tap dancing and ballet. He headlined at famous night spots like the Rainbow Room and Plaza Hotel’s Persian Room, danced at Carnegie Hall, and appeared in the 1948 ﬁlm “Time of Your Life.” His greatest fame was perhaps as part of a two-man act formed in 1940 with harmonica virtuoso Larry Adler, who also lived in Ridgeﬁeld around the same time Draper did. Draper’s career hit the same rocks that sank many artistic talents of the era: anti-communist blacklisting. Two other local notables of the day — a leftist presidential candidate and a right-wing newspaper columnist — were involved. Draper’s leftist leanings were no secret, and he publicly supported the 1948 presidential campaign of Progressive Party candidate Henry Wallace, a former vice president under Franklin D. Roosevelt. Wallace lived just across the line in South Salem and attended St. Stephen’s Church here. The trial ended in a hung jury and, dejected, Draper left Ridgefield in 1951 to live in Switzerland. Soon after, his friend and frequent partner Larry Adler, also subjected to anti-communist attacks, moved from Ridgefield to England where he died in 2001. He died in 1996 at his home in Woodstock, N.Y., at the age of 86. But he always denied ever having been a communist.